Location of Karachi in Sindh and in Pakistan. Karachi (كراچى) is the capital of the province of Sindh, and the largest city in Pakistan. Located on the coast of the Arabian Sea, north-west of the Indus River Delta, it is the cultural, economic, philanthropic, educational, and political hub, as well as the largest city and port, of Pakistan. Spread over 3,530 km², the city and suburbs comprise the world's twentieth largest metropolitan area. The city did not achieve importance until the British began to develop it as a military cantonment and a port in 1843. By 1914, Karachi had become the largest grain exporting port of the British Empire, and in 1924, when an aerodrome was built, Karachi became the main airport of entry into India. When the new country of Pakistan was formed in 1947, Karachi was a bustling metropolitan city with beautiful classical and colonial European styled buildings lining the city’s thoroughfares. Karachi was the capital city of Pakistan from 1947 until 1958. A large influx of economic and political migrants and refugees from different national, provincial, linguistic and religious origins have changed the demographics of the city and added to the diversity of the already cosmopolitan population. Karachi accounts for a large share of Pakistan’s GDP and revenue. It is locally termed as the City of Lights (روشنیوں کا شہر) for its liveliness, and the City of The Quaid (شہرِ قائد), for being the birthplace and home of Quaid-e-Azam Muhammad Ali Jinnah the founder of Pakistan. Residents and those born in the city are called "Karachiites." The area of Karachi was known to the ancient Greeks by many names: Krokola, the place where Alexander the Great camped to prepare a fleet for Babylonia after his campaign in the Indus valley; 'Morontobara' port (probably the modern Manora Island near the Karachi harbour), from where Alexander's admiral Nearchus sailed for back home; and Barbarikon, a sea port of the Indo-Greek Bactrian kingdom. To the Arabs it was also known as the port of Debal, from where Muhammad bin Qasim led his conquering force into South Asia in 712 C.E.. According to the British historian Eliot, parts of city of Karachi and the island of Manora constituted the city of Debal. The Baloch tribes from Balochistan and Makran, many of whom still inhabit sections of Sindh, established a small settlement of fishing communities in the area and called it Kolachi. According to legend, the present city began as a fishing settlement where a Sindhi fisherwoman by the name of Mai Kolachi took up residence and started a family. The village that later grew out of this settlement was known as Kolachi-jo-Goth (The Village of Kolachi in Sindhi). By the late 1700s, the village had started trading across the sea with Muscat and the Persian Gulf region. A small fort was constructed for its protection, armed with cannons imported from Muscat. The fort had two main gateways: one facing the sea, known as Khara Darwaaza (Brackish Gate) and the other facing the adjoining Lyari river known as the Meetha Darwaaza (Sweet Gate). The location of these gates corresponds to the present-day city localities of Khaaradar (Khārā Dar) and Meethadar (Mīṭhā Dar) respectively. In 1795, the village became a domain of the Balochi Talpur rulers of Sindh. A small factory was opened there by the British in September 1799, but was closed down within a year. After sending a couple of exploratory missions to the area, the British East India Company took over the town on February 3, 1839. The village was later annexed to the British Indian Empire when the province of Sindh was conquered by Charles Napier in 1843. Kolachi was added, along with the rest of Sindh, to the jurisdiction of the Bombay Presidency. Charles Napier, governor of Karachi from 1843 – 1847, realized Karachi’s importance as a military cantonment and a port for exporting the produce of the Indus basin, and rapidly developed its harbor for shipping. He established a regular supply of water to the city from the Malir River, developed housing and roads, drainage and sanitation facilities, and laid down the foundations of a city municipal government and a police system. He constructed a powerful lighthouse at Manora Point, and planned to make Karachi a free port by widening the entrance to the harbor, building docks, and connecting the island of Keamari to Karachi. In 1847, his health failing, he sailed home to England , saying as he was leaving, "You will be the glory of the East! Would that I could come again, Kurrachee, to see you in your grandeur!" Karachi was known as Khurachee Scinde (Karachi, Sindh) during the early British colonial rule. New businesses opened and the population of the town began rising rapidly. Karachi quickly turned into a city. In 1857, the First Indian War for Independence broke out in the subcontinent and the 21st Native Infantry stationed in Karachi declared allegiance to revolters, joining their cause on September 10, 1857. However, the British were rapidly able to reassert their control over Karachi and defeat the uprising. In 1864, the first telegraphic message was sent from India to England when a direct telegraph connection was laid down between Karachi and London. In 1878, the city was connected to the rest of British India by railway line. Public building projects such as the Frere Hall (1865) and the Empress Market (1890) were undertaken. In 1876, Muhammad Ali Jinnah, the founder of Pakistan, was born in the city, which by now had become a bustling city with railway, churches, mosques, courthouses, markets, paved streets and a magnificent harbor. By 1899, Karachi had become the largest wheat exporting port in the east (Feldman 1970:57). The population of the city had also risen to about 105,000 inhabitants by the end of the nineteenth century and was a cosmopolitan mix of Hindus and Muslims, European traders, Jews, Parsis, Iranians, Lebanese, and Goan merchants. By the turn of the century, the city faced street congestion, which led to India’s first tramway system being laid down in 1900. By 1914, Karachi had become the largest grain exporting port of the British Empire. In 1924, an aerodrome was built and Karachi became the main airport of entry into India. An airship mast was also built in Karachi in 1927, as part of the Imperial Airship Communications scheme, which was later abandoned. In 1936, Sindh was separated from the Bombay Presidency and Karachi was made the capital of the new province. By the time the new country of Pakistan was formed in 1947, Karachi had become a bustling metropolitan city with beautiful classical and colonial European styled buildings lining the city’s thoroughfares. Karachi was chosen as the capital city of Pakistan, and a huge influx of migrants and refugees to the newly formed country changed the demographics of the city. It maintained a great cultural diversity as new inhabitants arrived from all parts of the subcontinent. 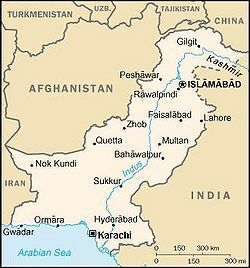 In 1958, the capital of Pakistan was shifted from Karachi to Rawalpindi and then to Islamabad in 1960. This was the start of a long period of decline in the city, owing to a lack of governmental attention and development. The 1980s and 1990s saw an influx of refugees from the Afghan war into Karachi. Political tensions between the Mohajir groups (descendants of migrants from the partition era) and other groups also erupted and for a time the city was wracked with political and sectarian violence. Karachi continues to be an important financial and industrial center for the country and handles most of the overseas trade of Pakistan and the central Asian countries. It accounts for a large portion of the GDP of Pakistan and a large proportion of the country's white collar workers. Karachi's population has continued to grow and is estimated to have surpassed 20 million, although official figures still show a population of around 14.5 million. The current economic boom in Pakistan has also resulted in a resurgence in the economy of Karachi. Karachi is located in the south of Sindh, on the coast of the Arabian Sea. The city covers an area of approximately 3,530 square kilometers, comprised largely of flat or rolling plains, with hills on the western and northern boundaries of the urban sprawl. Two rivers pass through the city: the River Malir which flows from the east towards the south and center, and the River Lyari, which flows from north to the southwest. The Karachi Harbor is a sheltered bay to the southwest of the city, protected from storms by Sandspit Beach, Manora Island and the Oyster Rocks. The Arabian Sea beach lines the southern coastline of Karachi. 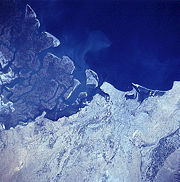 Dense mangroves and creeks of the Indus delta can be found towards the south east side of the city. Towards the west and the north is Cape Monze, an area marked with projecting sea cliffs and rocky sandstone promontories. Some excellent beaches can also be found in this area. Located on the coast, Karachi tends to have a relatively mild climate with low levels of average precipitation (approximately 10 inches per annum), the bulk of which occurs during the July-August monsoon season. Winters are mild and the summers are hot, however the proximity to the sea maintains humidity levels at a near-constant high and cool sea breezes relieve the heat of the summer months. Due to high temperatures during the summer, ranging from 30 to 44 degrees Celsius (86 to 111 degrees Fahrenheit) from April to August, the winter months (November to February) are generally considered the best times to visit Karachi. Most of the social events, ranging from weddings to charity fundraisers, are scheduled for July, December or January, which have pleasing and cloudy weather. Tourists and expatriates generally choose these months to visit Karachi. The City-District of Karachi is divided into eighteen towns governed by elected municipal administrations responsible for infrastructure and spatial planning, development facilitation, and municipal services (water, sanitation, solid waste, repairing roads, parks, street lights, and traffic engineering), with some functions being retained by the CDG. The towns are sub-divided into 178 localities governed by elected union councils (UC's), which are the core element of the local government system. Each UC is a body of thirteen directly elected members including a Nazim (mayor) and a Naib Nazim (deputy mayor). The UC Nazim heads the union administration and is responsible for facilitating the CDG to plan and execute municipal services, as well as for informing higher authorities about public concerns and complaints. Note: Defence Housing Society Karachi is located in Karachi but is not a town of Karachi nor part of any town of Karachi. It is administered by the Defence Housing Authority, Karachi of Pakistan Army. The population and demographic distribution of Karachi has undergone numerous changes over the past 150 years. 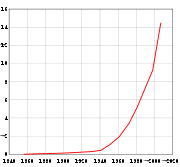 Non-governmental and international sources report that Karachi's current population is estimated to be 20 million—a huge increase over its population in 1947 (400,000). The city's population is currently growing at about 5 percent per year, including an estimated 45,000 migrant workers coming to the city every month from different parts of Pakistan. Karachi is the one of the largest megacities in the world. Before Pakistan's independence, Karachi had large communities of Muslims, Pashtuns, Muhajirs, Punjabis, Parsis, Jews, Hindus, Christians, Balochis, Gujaratis, and Sindhis. After independence, Muslim refugees settled in Karachi, while a large number of Hindus left the city for India. Predominantly Urdu-speaking Muhajirs formed the dominant ethnic group in Karachi. Muhajirs originated from different parts of India and brought with them their local cultures and cuisines, adding to the already diverse mix of people that already inhabited Karachi. This has given the city a very metropolitan character, and has earned it the title as the Melting Pot of Pakistan. The new government of the Pakistan Muslim League allotted most of the property left over by the departing Hindus and other groups to the Indian immigrants who had taken an active part in the creation of Pakistan. However, the large number of Muhajirs also formed a dominant political majority in the city, to the chagrin of the earlier provincial Sindhi and Balochi inhabitants. The vagaries of mass migration of populations between the two newly independent countries gave rise to ethnic tensions which have surfaced in Karachi from time to time. Since 1979, due to the Soviet invasion of Afghanistan and continued upheavals in their country, a steady stream of Afghan refugees have also taken up permanent residence in and around Karachi. These refugees now number more than one million and consist of a number of ethnic groups: Pakhtuns, Tajiks, Hazaras, Uzbeks, and Turkmen. There are also hundreds of thousands of Arabs, Iranians, Filipinos, Arakani refugees (from Rakhine State in Myanmar), Bosnian, Albanian, Polish, Lebanese, Armenian, Goan, Bengali and African immigrants settled in Karachi. Most refugee minorities of the city live in poor neighborhoods. Port of Karachi and Harbour with some of the city residential areas visible. Karachi is the financial capital of Pakistan; it accounts for a large share of its GDP and revenue. It generates approximately 65 percent (as of 1999) of the total national revenue (federal and provincial taxes, customs and surcharges) . On the Gross regional product (GRP) front, Sindh's share almost comprising 28 percent of the total GDP . Karachi produces about 42 percent of value-added in large scale manufacturing. In February 2007, World Bank termed Karachi the most business-friendly city in Pakistan. The city’s economy is large and diverse. Most of Pakistan's public and private banks have their head offices in Karachi; nearly all of them are located at Ibrahim Ismail Chundrigar Road (usually shortened to I.I. Chundrigar Road (Pakistan's Wall Street). During the 1960s, Karachi was seen as a global economic role model. Many countries sought to emulate Pakistan's economic planning strategy and one of them, South Korea, copied the city's second "Five-Year Plan." The World Financial center in Seoul is designed and modeled after Karachi. Karachi has a large industrial base, with several large industrial zones such as SITE, Korangi, Northern Bypass Industrial Zone, Bin Qasim and North Karachi located on the fringes of the main city. The primary areas of manufacture are textiles, pharmaceuticals, steel, and automobiles. In addition, Karachi has a vibrant cottage industry and there is a rapidly flourishing Free Zone with an annual growth rate of nearly 6.5 percent. Karachi’s industries include cement plants, corn mills, shipbuilding, chemicals, refined oil, shoes, machines and food production. Toyota, Honda, BMW, Mercedes, Nissan and Suzuki Motor Company are located in Karachi. Among others, Millat Tractors, Adam Motor Company, HinoPak and Ghandhara Nissan Buses and Trucks manufacturing plants are also located in Karachi. The automobile manufacturing sector is one of the fastest growing industries in Pakistan, and a large vendor industry associated with it is also located principally in Karachi. Besides being the banking and finance capital of the country, Karachi also hosts the offices of almost every major foreign multinational corporation as well as corporations based in Pakistan. It is home to the largest stock exchange in Pakistan: the Karachi Stock Exchange, which was considered by many economists to be one of the prime reasons for Pakistan's 8 percent GDP growth across 2005. The city garners 60 per cent of the tax receipts of the country and 70 per cent of the taxes of the province of Sindh. The per-capita income of the city is four to five times higher than the state average. Karachi is also the location of a nuclear power station. The Port of Karachi and nearby Port Qasim are the two main seaports of Pakistan, and Jinnah International Airport is the largest and busiest airport in Pakistan. The recent trends involving ICTs (Information and Communications Technology), electronic media and call centers have become a significant part of Karachi's business hierarchy. Call centers for foreign companies have been targeted as a significant area of growth, with the government making efforts to reduce taxes by as much as 80 percent in order to attract foreign investment in the IT sector. Karachi is also the software outsourcing hub of Pakistan. Many of Pakistan’s independent television and radio channels are headquartered in Karachi. Geo, ARY, Hum, AAJ TV, CNBC Pakistan and Dawn News are the most popular ones; some of the local stations include KTN, Metro One and Sindh TV. Karachi has an Expo centre which hosts many regional and international exhibitions. There are many development projects proposed, approved and under construction in Karachi city. Among projects of note, Emaar Properties is proposing to invest $43bn (£22.8bn) in Karachi to develop Bundal Island, which is a 12,000 acre (49 km²) island just off the coast of Karachi. The Karachi Port Trust is envisioning another Rs. 20 billion project, the Port Tower Complex, which will be 1,947 feet (593 m) high, the height indicating the Independence of Pakistan (14 August 1947), and is slated for completion within six years. It is expected to comprise a hotel, a shopping center, and an exhibition center. The main feature of the venture is supposed to be a revolving restaurant, which will also contain a viewing gallery offering a panoramic view of the coastline and the city. The tower is planned to be located at the Clifton shoreline. Some other mega projects that are proposed or under construction include: MCB Tower (completed), Port tower complex (proposed), Crescent Bay, Karachi (under construction), Karachi Waterfront (approved), Karachi Creek Marina (under construction), Dolmen Towers (under construction), I.T. Tower (approved), Bundal Island (under construction), Buddo Island (approved), Square One Towers (under construction), Sign Tower (approved), Karachi Mass Transit System, Enshaa Towers (approved), Karachi FPCCI Tower (proposed) and, IT Tower (approved), Dolmen Mall (Hyderi) (under construction), City Centre (proposed), Malir Expressway (proposed), Northern Bypass Industrial Area (under construction). Karachi is home to some of Pakistan's important cultural institutions. The National Academy of Performing Arts,  located in the newly renovated Hindu Gymkhana offers a two year diploma course in performing arts that include classical music and contemporary theatre. The All Pakistan Musical Conference, linked to the 45-year old similar institution in Lahore, has been holding its Annual Music Festival since its inception in 2004. The National Arts Council (Koocha-e-Saqafat) also has musical performances and Mushaira (poetry recitations). Karachi has several museums, including the Mohatta Palace Museum and the National Museum of Pakistan. The Kara Film Festival organized annually showcases independent Pakistani and international films and documentaries. The everyday lifestyle of Karachi differs substantially from that of other Pakistani towns. The culture of Karachi is characterized by the blending of Middle Eastern, South Asian and Western influences, as well as the status of the city as a major international business center. The considerable diversity in culture has produced a unique cultural amalgam. Karachi is also home of the largest middle class stratum of Pakistan. The Narayan Jagannath High School at Karachi, opened in October 1855, was the first government school established in Sindh. Karachi has a number of internationally-recognized educational institutes and several public and private universities. Karachi is also host to the Institute of Business Administration (IBA), founded in 1955, the oldest business school outside North America. Pakistan's Prime Minister, Mr. Shaukat Aziz, received an Masters of Business Administration (MBA) from this institute. Cricket is the most popular sport of Karachi, and is played in many small grounds around the city. Gully cricket is played in the narrow by-lanes of the city. Brightly lit night-time cricket matches are played on less traversed city streets. The major venue for cricket matches is the National Stadium but matches are also hosted at the UBL Sports Complex, The A.O. Cricket Stadium, the KCCA Cricket Ground, the Karachi Gymkhana Field and the DHA Cricket Stadium. National Stadium at night, Karachi, December 13, 2005. Other popular sports are hockey, boxing, football, golf, table tennis, snooker, squash, and horse racing. Other sports like Badminton, volleyball and basketball are also famous in school and colleges. The city has facilities for hockey (the Hockey Stadium of Pakistan, UBL Hockey Ground), boxing (KPT Sports Complex), squash (Jehangir Khan Squash Complex) and football (People's Football Stadium and the Polo Grounds). In 2005, the city hosted the South Asian Football Federation Cup at the People's Football Stadium. Marinas and Boating Clubs also add to the diverse sporting activities in Karachi. Karachi has a number of sporting clubs such as the Karachi Gymkhana, the Sindh Club, the Karachi Club, the Muslim Gymkhana, the Creek Club and the DHA Club that provide sporting facilities to their members, including tennis, badminton and squash courts, swimming pools, jogging tracks, gymnasiums, billiards and much more. There are two world class golf clubs, at DHA and Karsaz. Masjid e Tooba - largest single-domed mosque in the world. Karachi is dotted with many shopping areas, large and small, attracting large crowds of shoppers in the evenings. Saddar, Gulf Shopping Mall, Bahadurabad, Tariq Road, Zamzama, Zaib-un-nissa Street (Elphinestone Street) Hyderi and Waterpump (Anarkali Bazar) are the most famous shopping areas in the city. One can find all sorts of clothing, garments, and fabrics in Karachi's bazaars, as well as a number of other items. The Saddar area in downtown Karachi is also home to countless large and small markets dealing with everything from everyday household items to clothing and fabrics to electronics. Empress Market in Saddar is a large Victorian-era market, home to wholesalers of spices and other items. Saddar is also home to the Rainbow Center, one of the largest hubs of pirated CDs in the world. Some other notable shopping areas include Paposh Market and Hydari. The Jinnah International Airport, located in Karachi, is the largest and busiest airport in the country and handles ten million passengers a year. The airport also receives the largest number of foreign airlines; a total of 27 airlines fly to Jinnah International, predominantly from the Middle East and South East Asia. All of Pakistan's airlines use Karachi as their Primary hub including Pakistan International Airlines, Aero Asia International, Airblue and Shaheen Air. Karachi has the largest shipping ports in Pakistan at the Port of Karachi and Port Qasim. These seaports have modern facilities and not only handle trade for Pakistan, but also serve as ports for Afghanistan and the land-locked Central Asian countries. Plans have been announced for new passenger facilities at Karachi Port. Karachi is linked by rail to the rest of the country by the Pakistan Railways. The Karachi City Station and Karachi Cantonment Station are the city's two major railway stations. The railway system handles a large amount of freight to and from the Karachi port, and provides passenger services to people traveling up country. Plans are underway to extend the intra-city railway system to play a part in the city's mass transit with a Karachi Circular Railway system. Currently, commuter traffic consists primarily of motorists and minibuses, but there are plans to construct a light-rail based mass transit system in the city to decongest the roads and provide quick service to commuters. Karachi is located in semi-arid coastal desert with very limited agricultural land along the two small seasonal rivers, Lyari River and Malir River that pass through the city. Before independence, the area around Karachi had a sparse Balochi nomadic and fishing population and most of the land was state owned. 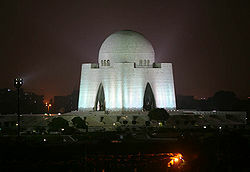 At the time of independence, Karachi was chosen as the first capital of Pakistan and land came under tight state control. According to the data prepared by the Master Plan and Environmental Control Unit of the Karachi Development Authority (KDA) in 1988, nearly 400,000 acres (1600 km²) of the 425,529 acres (1722 km²) that make up Karachi's metropolitan area are in some form of public ownership. The Government of Sindh owns 137,687 acres (557 km²), KDA 124,676 acres (504.5 km²), Karachi Port Trust (KPT) 25,259 acres (102 km²), Karachi Metropolitan Corporation (KMC) 24,189 acres (98 km²), Army Cantonment Board 18,596 acres (75 km²), Pakistan Steel Mills 19,461 acres (79 km²), Defence Housing Society 16,567 acres (67 km²), Port Qasim 12,961 acres (52 km²), Government of Pakistan 4,051 acres (16 km²) and Pakistan Railways 3,119 acres (13 km²). In the late 1990s, the undeveloped land belonging to KDA was transferred to the Malir Development Authority (MDA) and Lyari Development Authority (LDA). The Defence Housing Authority has purchased 12,000 acres (49 km²) of land from the Sindh government along the Super Highway and will build Phase II of Defence Housing Society. As one of the most rapidly growing cities in the world, Karachi faces challenges similar to those of many developing metropolises, including overcrowding, traffic, pollution, poverty and street crime. Due to a high increase in the use of automobiles, Karachi faces severe traffic congestion. It is estimated that about 4 million vehicles travel on the road during the evening and morning rush hours, far more than the existing road infrastructure was designed to carry. Time lost due to traffic congestion has a significant effect on productivity. A number of flyovers and underpasses have been opened for traffic since the last year or so, which has released the traffic jam to an extent but a number of projects are still under construction. The level of air pollution in Karachi is estimated to be 20 times higher than World Health Organization standards. A number of new parks have been developed and trees are being planted in the city to improve the environment and reduce the pollution. The economic boom of Karachi which brought higher living standards and new job opportunities during the 2000s, has had some adverse effects on employment, setting higher standards in some fields and excluding less-skilled lower-income workers and cottage industries. Another change brought by the economic boom was the rapid investment in land ownership, which raised real estate prices and made it difficult for ordinary people to buy land in the city. ↑ Muhammad Hussain Syed. Karachi Metropolitan Corporation. Retrieved April 26, 2012. ↑ Matanat Ali Khan. Karachi Metropolitan Corporation. Retrieved April 26, 2012. ↑ Geography & Demography. City District Government of Karachi. Retrieved August 22, 2010. ↑ United Nations World Urbanization Prospects report (online data) 2010 population estimates for Pakistan. Retrieved April 26, 2012. ↑ Ardeshir Cowasjee, Karachi under the Raj 1843-1947, The DAWN Group of Newspapers. Retrieved November 17, 2007. ↑ Note that there is some dispute over the population of Karachi. The City Government of Karachi on its website claims "Karachi is today a city of more than 15 million inhabitants." The official census showed 1998 population as 9 million. Some legitimate reasons for the discrepancy might be that the workers living in Karachi have their registered address in another part of the country as they may not have a permanent home in Karachi. Although the city would consider such a person a resident of Karachi, using Karachi's infrastructure and contributing to its economy, the National Database and Registration Authority (NADRA) would not count this person as a resident of Karachi. Another reason is that Afghan Refugees were not counted in the 1998 census, and all official estimates simply extrapolate the numbers from the 1998 census. Amin, Mohamed, Duncan Willetts, and Brian Tetley. 1986. Karachi. Karachi, Pakistan: Pak American Commercial Ltd.
United Nations. 1988. Karachi. Population policy paper, no. 13. New York: United Nations. All links retrieved April 11, 2018. This page was last modified on 11 April 2018, at 15:48.